Compatible with most Apple iOS and Android cell phones Including iPhone 5, 5s, 5c, 6 and 6 Plus with iOS 8.2 or later and devices with Android 4.3 or later. At-a-glance notifications Receive your messages, news, weather and much more without checking your phone. 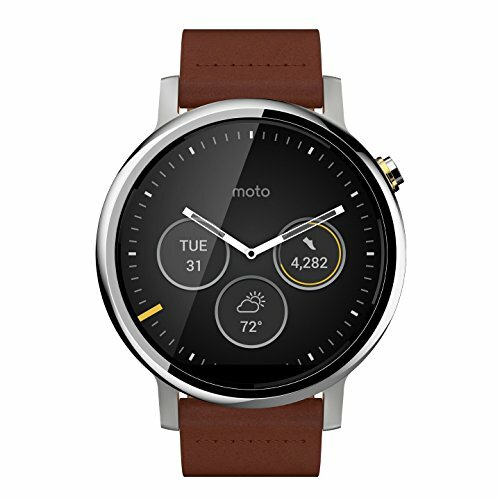 Moto Body fitness tracker Monitors your steps, calories and heart rate, so you can meet your goals. Simple navigation and clear visuals A backlit LCD with 263 ppi (360 x 325) resolution provides a sharp view, even in dim lighting. Aircraft-grade 316L stainless steel case with scratch-resistant Corning Gorilla Glass Creates a durable design. The round design with edge-to-edge glass and a thin bezel offers a stylish look. IP67 water-resistant design Safeguards against moisture. Wireless connection to your device A Bluetooth 4.0 LE interface simplifies device pairing. Google Play apps Download apps like Spotify, Shazam and Ford for versatile functionality. Voice-activated design Lets you control the smartwatch simply by speaking. Ambient mode Extends the battery life, so you can enjoy lasting use.